If you don’t already, you should go and subscribe to the British Museum Youtube channel immediately. One Saturday breakfast time a couple of weeks ago I watched the video of Tom Scott playing this game against Irving Finkel. Now. A couple of weeks earlier, after making some firewood dice, we’d been playing with making firewood platonic solids. Tetrahedron, Cube, Octahedra… that kind of stuff. As you do. So we sketched out the board on a sheet of paper, grabbed the big tub of dice, and started playing. It’s a fun game. 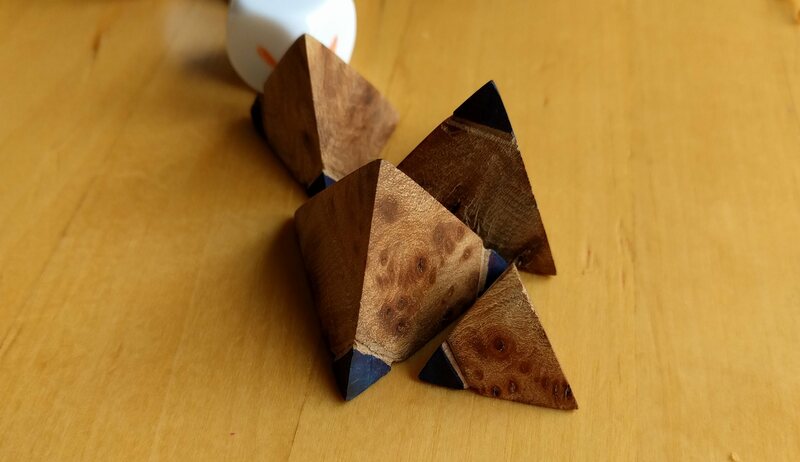 We only had two wooden tetrahedra, so we used some blank dice with three dot faces and three blank faces to match the probabilities of the tetrahedra. Robin appears to be quite good at it. So we then move the board onto a left over chunk of oak flooring and start hitting it with chisels and whittling knives. We also started making little dice and counters. These dice are effectively coins, and are hard to pick up. Having four of them means you can score 0,1,2,3 or 4 – which makes a change from 1-6. 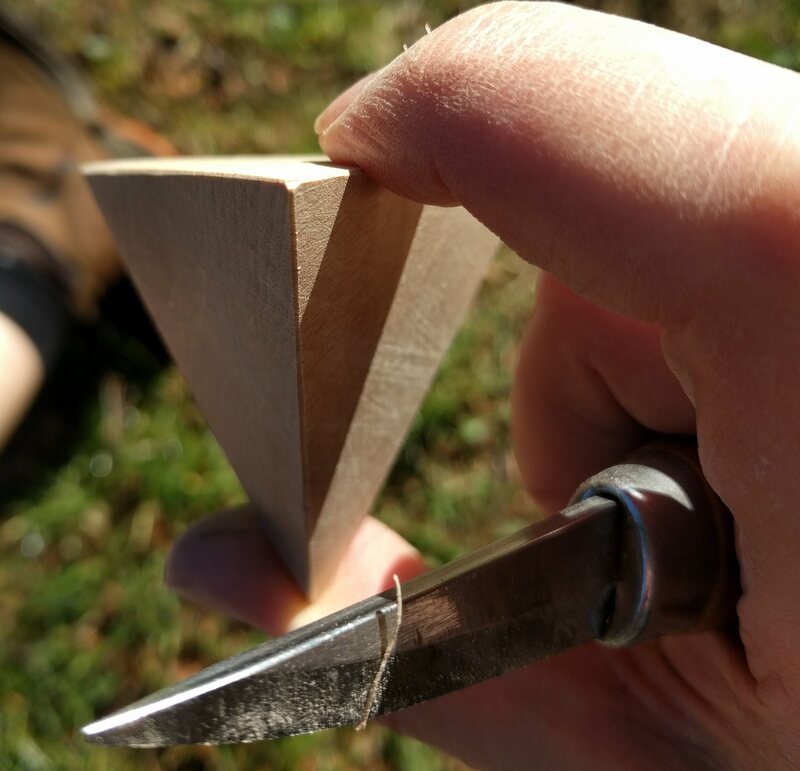 Burr from the log pile, plus saw, plus sandpaper = tetrahedral dice. It’s not finished yet – but it’s a fun game. You should make one. Quick sidebar on buying game bits. For maybe £20 you can stock up a tub with dice, counters, meeples, and other game components. Having these handy for this kind of thing on a saturday morning is fun – if the wee lads are into a new game, or want to add a feature to an existing game, being able to quickly mock them up is great. If you wait until the bits arrive the interest will have passed and life is pointless. This whole X a Y thing is addictive. Reading a book a week is fun. In addition, as a family, we appear to be trying a new board game a month in 2017. This should be easier. We love a bit of Carcassonne, Chess or Junk Art. Trying a few more games should be fun. Freezing outside = #boardgames inside. January – Sushi Go Party. Deal a deck of cards from a MASSIVE tin box of cards, with all kinds of shushi on them. Pick a card you want to keep, and pass the rest of your cards to your right. Repeat. Do you try to make high scoring combos, or just keep high scoring individual cards? Do you aim high and risk collapse, or play safe and hope for the best? Do you play your own game or try and block your brother? Great value considering the sheer amount of variation in the game, the number of cards, and the nice tin. Roll some dice, to score points, strike opponents, and other stuff. You play a sheriff, or an outlaw, or something. You have to try and kill your opponent. Some nice character cards, neat dice, and really fun quick game play that even the most distracted five year old will grasp in seconds. Also, wild west theme. Fun. Nice small box too, so good to tuck in the suitcase/car as an emergency rainy day half hour filler. King of Tokyo is the current head a shoulders leader of the boardgames. Parasitic Tentacles causes the odd grumpy battle – but on the whole it’s a perfectly balanced game for <10s. Just complicated enough to hold interest, without overloading the players with too many contradictory factors. Collect energy, buy power ups, earn victory points, try not to lose too many health points. The power up cards are really well done – full of character and the boys love just finding out what’s next in the stack.